Pension and benefit obligations weigh down our cities. Trash disposal in Chicago costs $231 per ton, versus $74 in non-union Dallas. ‘Which side are you on?” That was the question posed nearly a century ago in Florence Reece’s song about the bitter war between miners and coal bosses in Harlan County, Ky. Many Americans, including Franklin Roosevelt, pondered hard—and then sided with the unions. Today Americans have to choose sides again. This time it is not industrial but public-sector unions that wage war. And this time the unions’ foe is a state or city government, not a private company. But citizens can’t seem to make up their minds. Madison, Wis., has been a battleground ever since Gov. Scott Walker tried to limit the collective-bargaining rights of teachers and other public-sector employees in 2011. Recently many New Yorkers instinctively rallied to support Patrick Lynch, the leader of New York City’s police union, when he blamed City Hall for the recent shooting of two police officers. But the same people spend other seasons simmering in resentment over the tax burden they must shoulder to pay for exorbitant retirement packages for the same kind of public employee. One reason for such ambivalence may be that most of us don’t know much more about unions generally than a few folk-music chords. Unionspeak features a baffling and tiresome vocabulary that seems designed to deter the generalist. What exactly is an “agency shop,” a “fair-share provision” or a “dues check-off”? Without discerning much difference between a public union and a private one, people default to an emotional response. Policemen—or firemen or teachers—are underdogs who work hard, and we should support them. Roosevelt liked unions, so we should. All the more useful then is “Government Against Itself: Public Union Power and Its Consequences” by Daniel DiSalvo. 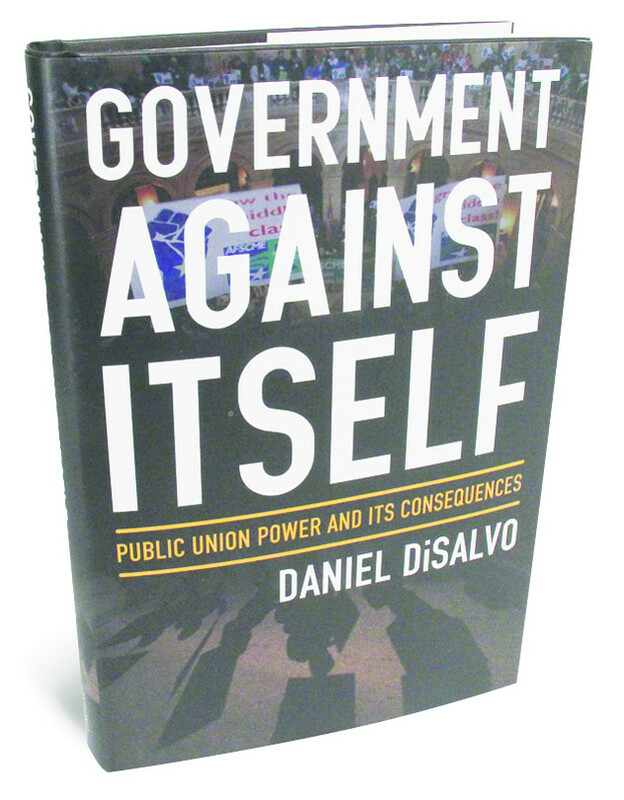 Mr. DiSalvo does take sides, arguing that “unionization and collective bargaining in state and local government impose significant costs on society while providing few broadly shared benefits.” Still, the value in “Government Against Itself” lies not in the conclusion but in the lucid fashion in which his primer lays out facts and busts myths. As Mr. DiSalvo shows, public-sector unions are also rich. Taken together, they spend hundreds of millions of dollars annually lobbying governments on behalf of their members. Our courts have ensured that funding for political activity will flow in the future by upholding rules that require payments from workers. Opponents of public-sector unions must content themselves with minor victories such as the recent Supreme Court opinion in Harris v. Quinn, which grants home-care workers, a narrow group, the right not to pay union dues. This modern imbalance exists because of some long-ago shifts in federal law. In 1962 President John F. Kennedy signed Executive Order 10988, permitting collective bargaining for federal employees. State and city workers, teachers and firemen were also unionizing. There is something grotesque about public workers fighting for benefits whose provision will hurt the public. Citizens who vote Democratic may choose not to acknowledge the perversity out of party loyalty. But over the years a few well-known Democrats have sided against the public-sector unions. “The process of collective bargaining as usually understood cannot be transplanted into the public service,” a Democratic politician once declared. His name? Franklin Roosevelt. Miss Shlaes chairs the board of the Calvin Coolidge Foundation and serves as presidential scholar at the King’s College in New York City. Posted on January 19, 2015, in Postings. Bookmark the permalink. Leave a comment.